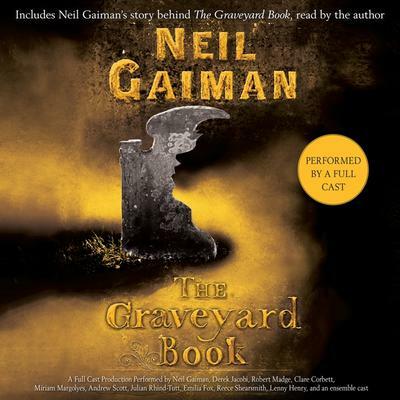 The original hardcover edition of a perennial favorite, The Graveyard Book by Neil Gaiman, which has sold more than one million copies and is the only novel to win both the Newbery Medal and the Carnegie Medal. Bod is an unusual boy who inhabits an unusual place—he's the only living resident of a graveyard. Raised from infancy by the ghosts, werewolves, and other cemetery denizens, Bod has learned the antiquated customs of his guardians' time as well as their ghostly teachings—such as the ability to Fade so mere mortals cannot see him. Can a boy raised by ghosts face the wonders and terrors of the worlds of both the living and the dead? The Graveyard Book is the winner of the Newbery Medal, the Carnegie Medal, the Hugo Award for best novel, the Locus Award for Young Adult novel, the American Bookseller Association’s “Best Indie Young Adult Buzz Book,” a Horn Book Honor, and Audio Book of the Year. The cast of voice actors is super here. Its a wonderful modern and somewhat eccentric story of a boy raised by a myriad of characters all dead, most buried in the graveyard near his birth home where his family is murdered and boy comes to grows up with the freedom of the graveyard. The characters come from times spanning the centuries. Good fun with a shady subplot about his families murders.